California is still the worst place to do business according to the 11th annual survey of CEOs conducted by Chief Executive magazine. It is very disappointing, but not a surprise, as we see CEO's voting against California by dedicating few manufacturing investments to the state. 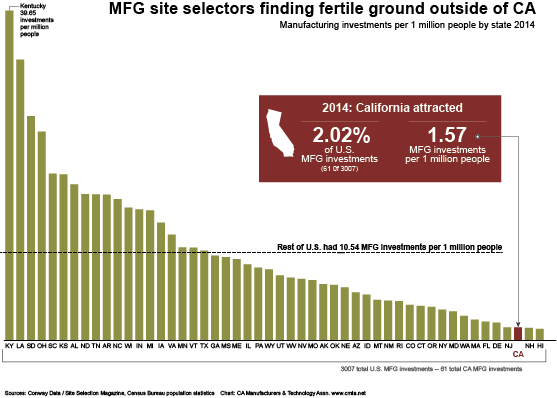 Last year California attracted only two percent of manufacturing investments made in the US. When given a choice, companies are making long term commitments to other states. California has made great strides to improve the business climate for manufacturing in recent years by providing a sales tax exemption for the purchase of manufacturing equipment and launching the CalCompetes job credit program. We hoped to see better investment numbers in 2014 and an uptick in CEO sentiment this year. California remains a high cost state with plenty of regulatory challenges, so it will take time and effort to market the benefits in California and prove that our state offers tremendous advantages for companies willing to take another look. If we do get their attention again for possible investments, we will need to show that they can count on regulatory certainty, fair taxes, affordable energy, and reasonable labor policies to support their long term success. Before we can make that commitment, we need to be honest with ourselves about what needs to be fixed in California. For many years CMTA has been urging legislators to pay attention to job and investment data to inform their decision-making on business bills. But other groups like to spin economic data to look better than it is, by touting an increase in gross numbers of jobs, for example, rather than modest percentage changes in our large economy. Playing games with the numbers might distract the media and give some legislators a reason to dismiss our concerns, but it doesn’t fool CEOs and other job creators. Legislators need to accept the truth of our situation and fix problems like high-taxes, skyrocketing electricity prices, a litigious permitting system, and out-dated labor laws. Until that happens, opponents of reform will get away with fudging the data to protect policies that support their interests and not the broader economy. Our vision of California includes a dynamic, prosperous manufacturing sector with growing opportunities for high-wage employment for skilled workers. The state has tremendous natural resources, excellent access to markets and unbeatable innovation. Our business climate challenges are entirely man-made. They could be solved by dedicated leaders who face the truth of our current circumstances and take bold steps to improve the business climate. Let’s take action and change CEO minds before the next survey in 2016.